This little angel! Our newborn session was on a rainy afternoon and baby Lilah was perfectly content snuggled up with Mom and Dad. This is reason #4802 that I love lifestyle newborn photography. Generally I come to you unless we agree to meet in my studio which is set up with natural window light. You don’t have to pack up babe and bring all your stuff, I come to you. That connection in your own nest is precious. Also can we talk about that newborn smile? She was just a little sweet peach. 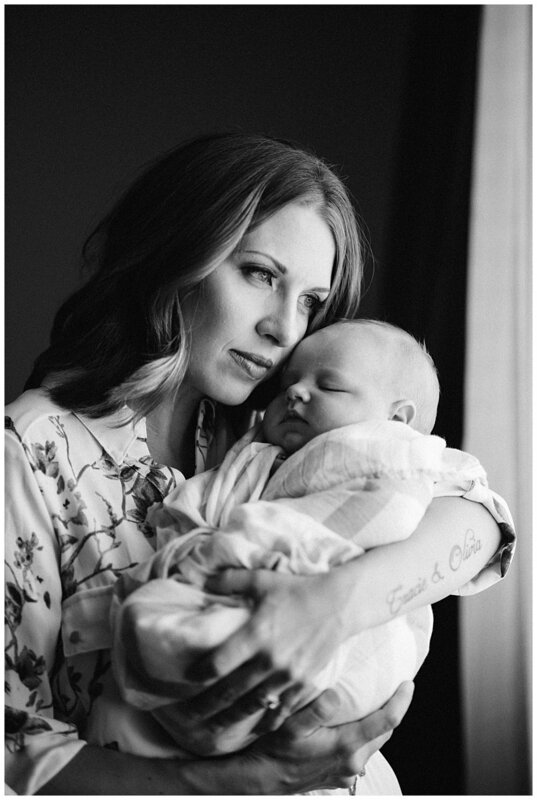 See her mom and dad’s sweet and pretty Calgary Lifestyle maternity session here. I had the honour of capturing newborn photos for a very talented photographer mama for her third boy. They are just a gorgeous family and I love family photography done in a lifestyle photography way which means I do use props or big studio lights. I prefer natural light, in the client’s home if that works or my studio which is natural light. To me, it is about the connection and things that make a family unique. Sweet baby Peyton arrived into this world a little early and she is such a tiny little bundle of sweetness. How darling is that head of fuzzy dark hair? My heart. This little guy is what I would best describe is solid. And I love it! 6 weeks and 13 lbs! His older sisters are identical twins and little dolls. What an adorable family!